We can't make this up—it's being served at the "1492 Cart" in Columbus Circle. Image via Flickr/Portal Abras, Justin Bolois. If you've followed the saga of the chopped cheese, you know that the sandwich is no stranger to controversy. 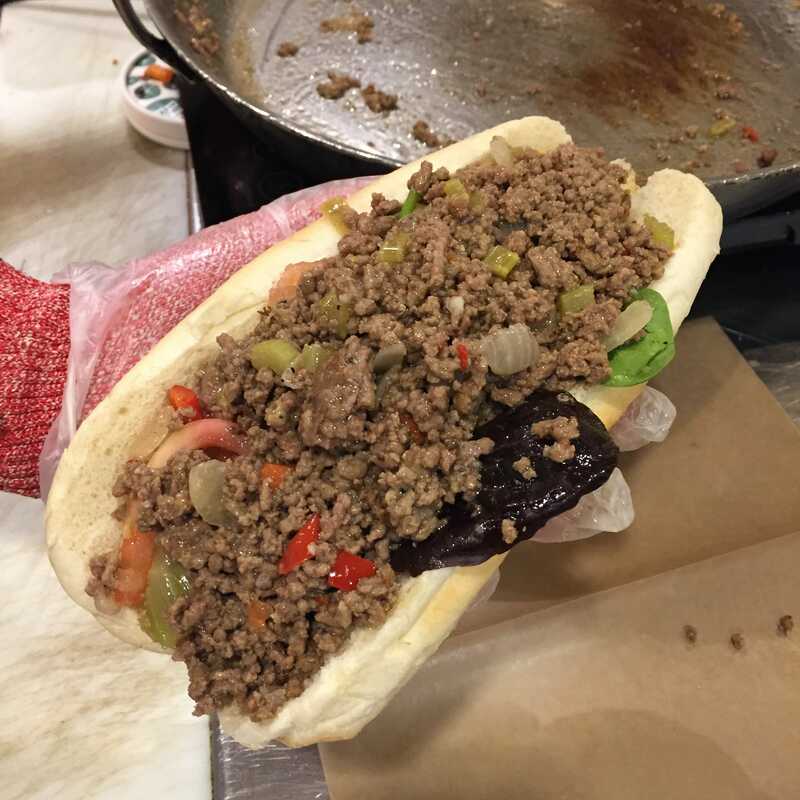 In recent months, establishments that have tried to recreate New York's hyper-regional specialty have been met with fierce resistance from chopped cheese loyalists. The sandwich is a local’s-only symbol of pride perfected in outer borough bodegas, and its devotees are well attuned to the consequences of “Columbus Syndrome” and cultural appropriation. Now, Whole Foods, one the most notorious symbols of gentrification, brings these issues to centerstage with its latest item: an $8 chopped cheese, served unironically from the store’s “1492 Cart” at the Columbus Circle location. It’s not hard to understand why the appearance of a chopped cheese sign, adjacent to a palette of snap pea crisps, would rub people the wrong way. This is the same supermarket that received backlash in 2015 when it charged $6 for asparagus water, suggesting not only issues of price gouging, but also the store’s instinct to jump on culinary trends. The store’s track record doesn’t bode well for the chopped cheese. Skeptics believe the new item is about riding a wave of opportunity, rather than honoring a source. “People in New York know it, but not tourists,” Khalid explained. After a few moments, a customer walked by, read the sign, and asked the cook if the sandwich was made with beef, or if it was vegan. “Being at Whole Foods, I just assumed vegan,” she said. While similar attitudes have landed folks in hot water, Van Hook’s scenario adds an extra layer of texture. He traces his inspiration to an episode of Anthony Bourdain: Parts Unknown, which briefly touched on the bodega sandwich when the host was interacting with a group of Bronx school kids. But Van Hook's interest was also a direct appeal to members of the Whole Foods staff, many of whom commute to Manhattan from the Bronx everyday for work. The 1492 Cart isn’t just about feeding customers and curious passersby, but also hundreds of employees. “Our main customers are our team members, ” Van Hook explained. Still, reactions at the store have been mixed. According to Van Hook, team members aren’t accustomed to ordering the Whole Foods version, but are still eating the sandwich regardless. In many ways, the episode can be seen as a different iteration of an old story—selling a piece of Bronx culture back to Bronx natives at a higher price. It’s the sort of conundrum that Harlem blogger Jeffrey Almonte warned about in his viral rant about the chopped cheese and Columbus Syndrome earlier this year. But regardless of the issues raised by the Whole Foods chopped cheese, it looks like the store may have bigger plans for the item. “I could see it as an option on our burger menu,” said Van Hook, who admitted to not having tried a chopped cheese other than the one served at Whole Foods. “Beer is more my passion,” he confessed.